I have made old style headlamps for inch and a half scale engines but never an actual oil burner. The first task was to find an oil lamp mechanism and chimney that was small enough. I finally found a beautiful solid brass burner and glass chimney made in England. This basically determined the size of the headlamp. Here you see the main cylinder for the body and the front and back. This is the die and formed bits for the headlamp base. Most of the brass in the headlamp is .040". 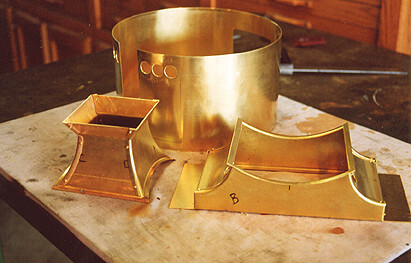 The forming dies for these pieces is 3/16" steel. 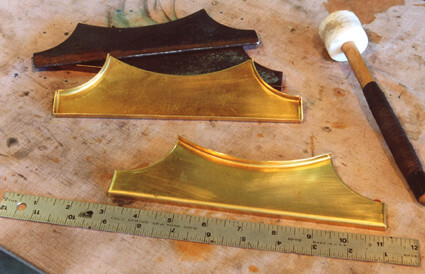 The brass is clamped between the dies with some C clamps, and the edge worked over with a plastic or rawhide mallet. 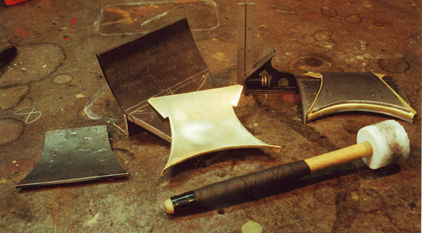 Never use a metal hammer when forming brass, it will leave dents. 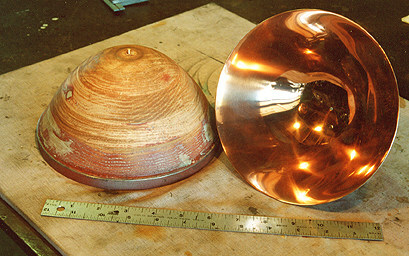 The reflector for the headlamp was made of .032" copper. 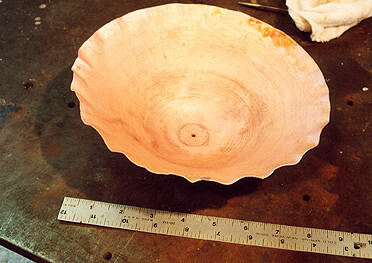 It was spun on a wood die in the lathe. I have since learned to make them out of thicker material, as it doesn't wrinkle so easily. After the first spinning you get a work hardened wrinkled mess as you can see in the photo. Take it off the die and gently flatten out the piecrust around the edges with a rawhide mallet then anneal it. To anneal heat it to dull red and quench in ice water, the colder the water the better. This will soften the copper and you can return it to the die and have at it some more. 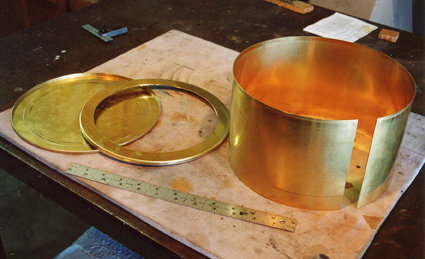 These reflectors have quite a dish to them and will need to be annealed and returned to the die eight or ten times. Here is the mostly done reflector, sitting next to the die it was formed on.. It has had a piece of 2" tube soldered to the back so it can be spun in the lathe for polishing. Polishing is started out with an angle die grinder and #80 grit, working down with finer and finer grit until you reach #1000 grit. And then Semi Chrome metal polish. After you get it looking like a mirror it's time to cut the holes for the burner and chimney. One towards the bottom, and one towards the top. The trick is to do this without scratching it because you can't spin it in the late once you cut the holes. Then off to be nickel plated. copyright © 2004-2006, Jack Bodenmann, all rights reserved.